The Atlas 3B is a two-stage rocket capable to lifting payloads of 4,500 kg (9,920 lb) into a geostationary transfer orbit. It features no strap-on solid rocket boosters and is the most powerful version of the Atlas family currently available. Atlas is the name of a family of booster stages. Centaur is a family of high-energy, restartable upper stages. Atlas 3 is the designation for an Atlas 3 stage with a booster engine and a Centaur 3 upper stage. 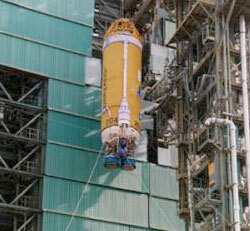 The Atlas 3B uses a "stretched" Centaur. 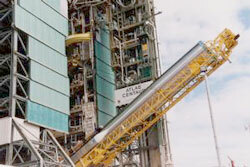 The Atlas booster is 10 feet in diameter and 95 feet long. The propellant tanks are a thin-wall, fully monocoque, corrosion resistant stainless steel construction. The fuel tank, which contains RP-1, and the oxidizer tank, which contains liquid oxygen, are separated by an ellipsoidal intermediate bulkhead. Structural integrity of the tanks is maintained in flight by the pressurization system and on the ground by either internal tank pressure or application of mechanical stretch. Centaur, the Atlas upper stage, is 10 feet in diameter and 38.5 feet long. It employs high-energy liquid hydrogen and liquid oxygen propellants separated by a double-wall, vacuum-insulated intermediate bulkhead. The propellant tanks (like those of the Atlas stage) are of thin-wall, fully monocoque, corrosion-resistant stainless steel construction. Tank stabilization is maintained at all times by internal pressurization or application of mechanical stretch. The Atlas 3B and the Atlas 5 family of launch vehicles will utilize the Common Centaur. This Common Centaur stretches the tanks an additional of 5.5 feet to a total length of 38.5 feet to carry more propellant, which in turn allows greater engine burn times and increased performance. The first Common Centaur tank is scheduled to fly on the first Atlas 3B mission designated AC-204. The Centaur propulsion system uses two RL10A-4-1B engines with an extendible nozzle manufactured by Pratt & Whitney. The Centaur engine is restartable and is capable of multiple firings in space, separated by coast phases. The payload fairing protects the spacecraft from time of encapsulation through atmospheric ascent. The fairing used by the EchoStar 7 mission is 14 feet in diameter. The fairing provides thermal and acoustic enclosures for the payload and launch vehicle electronic compartments during prelaunch and ascent. Portions of the external surface of the fairing are insulated with cork to limit temperatures to acceptable levels. Noncontaminating thermal control coatings are used on internal surfaces to reduce incident heat fluxes to the spacecraft. The payload fairing is jettisoned 18 seconds after Centaur Main Engine Start 1. Launch site: SLC-36B, Cape Canaveral AFS, Fla.
EchoStar 7 - Description of this direct-to-home TV broadcasting satellite.